If you’re facing a criminal allegation in Sterling Heights Michigan, you need a criminal defense attorney who will take immediate action on your behalf to protect your interests. A criminal charge can affect you for many years and impact your freedom, family, work, and driving privileges. Why settle for a second rate lawyer or court appointed counsel? The ability to obtain effective, professional legal representation is yours by contacting Hilf & Hilf, PLC. If you are facing a criminal charge in Sterling Heights, the first step is to hire a trusted criminal defense lawyer. Do not go unrepresented, or with legal counsel that does not have your best interests in mind. You and your family's future are important and you should not take chances with the quality of your attorney. With every criminal case you are opposed by well prepared prosecutors, police officers, detectives, and the other money rich resources of law enforcement. On top of all this, you also have to contend with the Judge assigned to your case. Having an aggressive and knowledgable lawyer on your side fighting the government, and who diligently works on your case, looking to find the inconsistencies in the prosecutor's case, and who is willing to fight for a great result, is exactly what you need for your criminal defense lawyer. Do not underestimate the power of great lawyering and contact attorney Daniel Hilf of Hilf & Hilf, PLC to discuss your case. When it comes to your defense, there is no room for a shoddy defense, bad legal advice, or anything short of professionalism and respect from your lawyer. 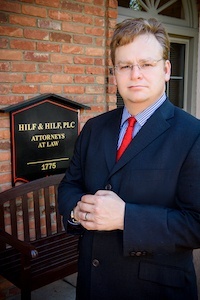 Lawyer Daniel Hilf's commitment is to aggressively defend clients and not to pass judgment. Attorney Hilf is here to get past a bad moment or bad decision, by fighting to try and restore your life. Being falsely accused of a crime is the worst thing that can happen to anyone. Trying to convince others that the accused is actually a victim is often a tough battle, and for this fight you should hire the best lawyer available to you. The criminal justice system has systematic flaws that sometimes results in innocent persons being charged with crimes through no fault of their own. The false allegations are brought into the criminal justice system for a variety of reasons, including: violations of Constitutional rights; false assumptions; lies; deceptions; mistakes made by police officers; jumping to false conclusions; persons targeted by police officers (such as rounding up the "usual suspects"); prejudice and bias. Attorney Daniel Hilf vows to fight against false convictions by devoting the proper time and passion to fight for the right result. On many occasions people are "overcharged" by the prosecution. Overcharging happens when the prosecution believes and charges a more severe charge than what really occurred. For example, a person accused of home invasion may have had permission to be in the residence, and a lessor charge should have been pursued for a fight that occurred within the home after the person was invited inside. T In some cases the goal of the defense is to fight for a conviction to a lessor offense, and in other cases the goal is to fight for an outright acquittal. Some cases are all about trying to resolve the case for the best possible result. The trial strategy that is right for your case is up to you and your lawyer. Protecting client rights, compassionate advocacy, placing the case in the right light, hard work, and persuasion all play significant roles in attorney Daniel Hilf's legal representation. Before you settle upon a lawyer, make sure you research his or her professional background. Your research will tell you that attorney Daniel Hilf is a top rated metro-Detroit lawyer, with over 20 years of criminal defense experience and over 100 completed jury trials, representing thousands of satisfied current and former clients. He has won national awards and media attention for his advocacy. Have you been accused of a crime, and do you need to go to Court at the 41A District Court in Sterling Heights, Macomb County Circuit Court, or another metro-Detroit area courtroom? Hilf & Hilf, PLC attorney Daniel Hilf is the fighter that you need, and often can make himself available upon short notice. Payment plans are available in many instances, and Hilf & Hilf, PLC accepts credit card, debit card, check, money order, cash, wire transfer, and other payment methods. Do not delay and contact Hilf & Hilf, PLC today.